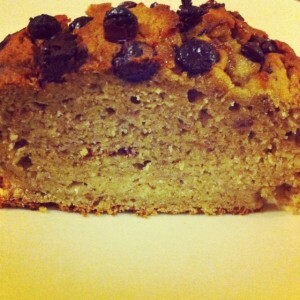 Gluten Free, Wheat free Banana and Choc Chip Cake. It’s been a hard few days….I fancied cake. Being a wheat intolerance, lover of all thing healthy, dietitian type, going to the shop was not an option. So I embraced the baking love and created this beauty. I’ll be honest, I wasn’t sure if it would work….but it did, the big bonus, it took about 10 minutes to whip up. I really should have more faith in myself! Mix the dry ingredients first, then add the eggs and oil. Sprinkle the top with chocolate chips. Bake at Gas Mark 5 for 35 minutes. I used frozen, defrosted bananas. Whenever I have bananas going a bit over-ripe I stick them in the freezer for baking purposes. 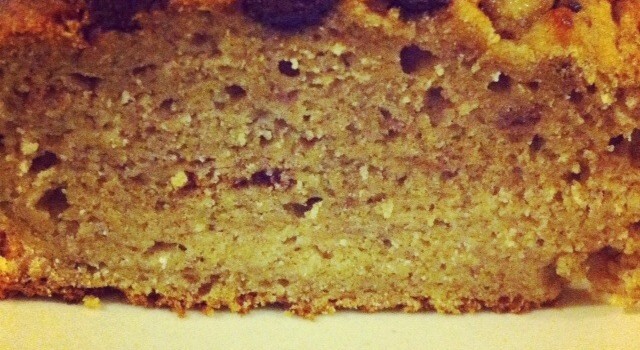 For example we often make our famous flapjack. Next time I’m going to stir the chocolate chips through, they were kind of an afterthought….but a pretty tasty one!